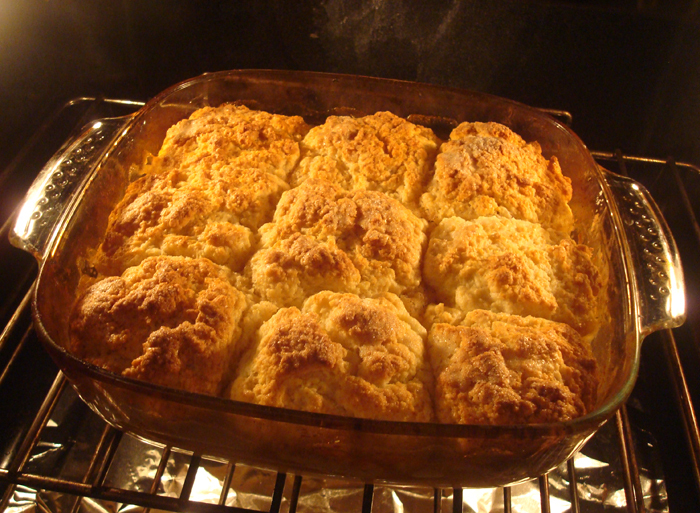 Peach cobbler just sounds like the ultimate, most delicious, stereotypical American dessert. I always remember hearing it mentioned on American TV shows and promised myself that one day I would make sure that I tried some of this cobbler for myself. Well now I’m older and I know how to bake, so I decided to make it myself rather than travel across the pond in search of a restaurant that makes this beautiful dessert. Alas, peaches are not in season in December and I didn’t want to use canned peaches (bleurgh!). Never fear, my hopes of making a cobbler weren’t completely dashed as a quick search on google told me that pears are in season (hooray!). With Christmas quickly approaching, I’m seeing loads of recipes for Poached Pears in Mulled Wine. Now, poached pears on their own are a bit boring (not to mention that they sound like something you would serve to a person with no teeth). Soooooo I began thinking; poached pears, mulled wine, cobbler…poached pears, mulled wine, cobbler and the Spiced Pear Cobbler was born! I decided to use white wine instead of red. 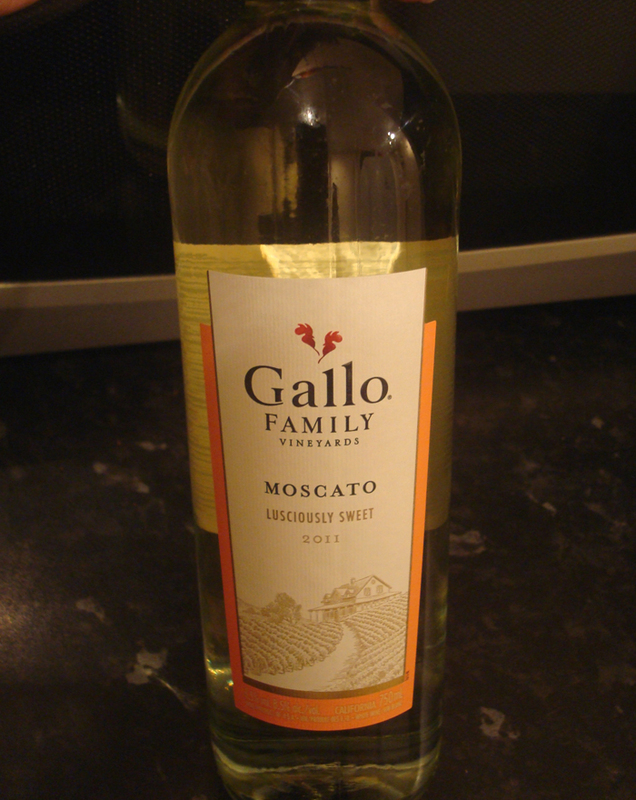 Any white wine will do. I thought a medium-sweet wine would go well with this dessert and just bought the cheapest bottle I could find at the supermarket :-). I incorporated all the flavours of a mulled wine, slapped the cobbler biscuit on top, bunged it in the oven for 30 mins and voilà. It’s almost as though the pears are being poached in the wine as they bake in the oven, while the cornflour makes the wine, sugar and spices into a yummy syrupy sauce. This is relatively quick and easy to make once you’ve peeled and chopped the pears. Its not a particularly sweet dessert and goes great with hot custard (my favourite) or a scoop (or two) of vanilla ice cream. It tastes even better the next day, after you’ve allowed the pears to sit in their juices overnight. Preheat the oven to Gas Mark 7/220C/425F and adjust the oven rack to a lower-middle position. Squeeze the lemon juice into a 9-inch square baking dish. 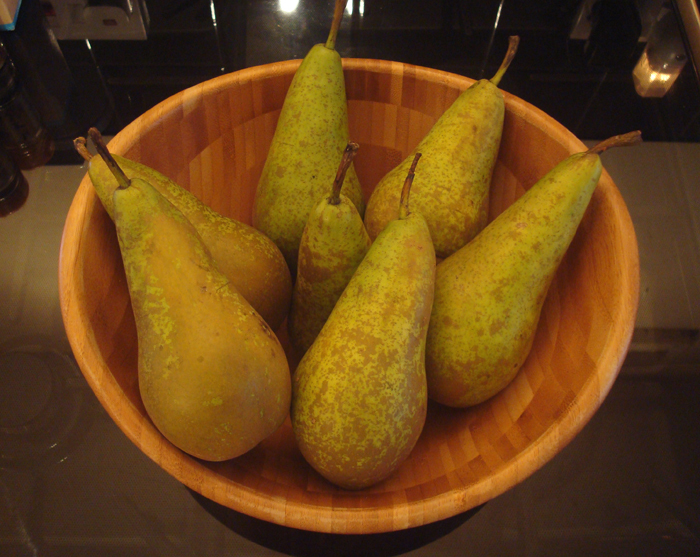 Peel, core and slice the pears into 1/4 inch thick wedges and toss them in the lemon juice to stop them from browning. Add the sugar, vanilla, cinnamon, nutmeg, cloves, wine and cornflour and toss the pears in this mixture. Leave to stand in the juices while you prepare the topping. In a food processor (or with cold hands) combine the flour, 100g sugar, baking powder, baking soda and salt (if using unsalted butter). Pulse so that they are well incorporated. Place the butter over the flour mixture and pulse again until the mixture resembles large breadcrumbs (no longer than 20 seconds of pulsing). Bake the pears in the oven for approx 10 mins until the juices begin to bubble around the edge of the dish. Remove from the oven. While the pears are baking, transfer the flour mixture to a bowl and add the yoghurt. Using a large metal spoon or a rubber spatula, combine the flour and yoghurt until a dough starts to come together. Be careful not to overmix the dough. Break the dough into 9 evenly sized, roughly shaped balls and set aside. Place the dough balls on top of the pears, making sure the dough balls aren’t touching each other. 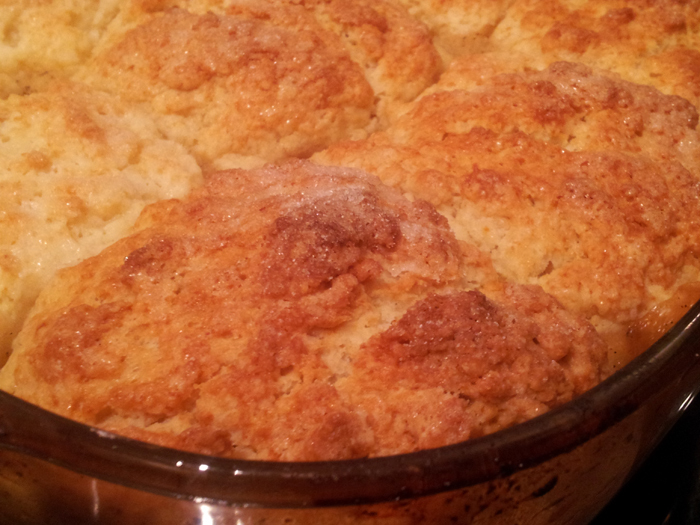 Sprinkle the dough balls with the remaining TBS of sugar and place the dish back in the oven. Bake until the topping has turned golden brown and the pears underneath are bubbling. This will take anywhere between 18-30 mins depending on your oven. Remove from the oven and leave to stand for 20 mins, then serve.